Apple Maps has added public transit directions for Ireland, as pointed out by developer Steven Troughton-Smith on Twitter. 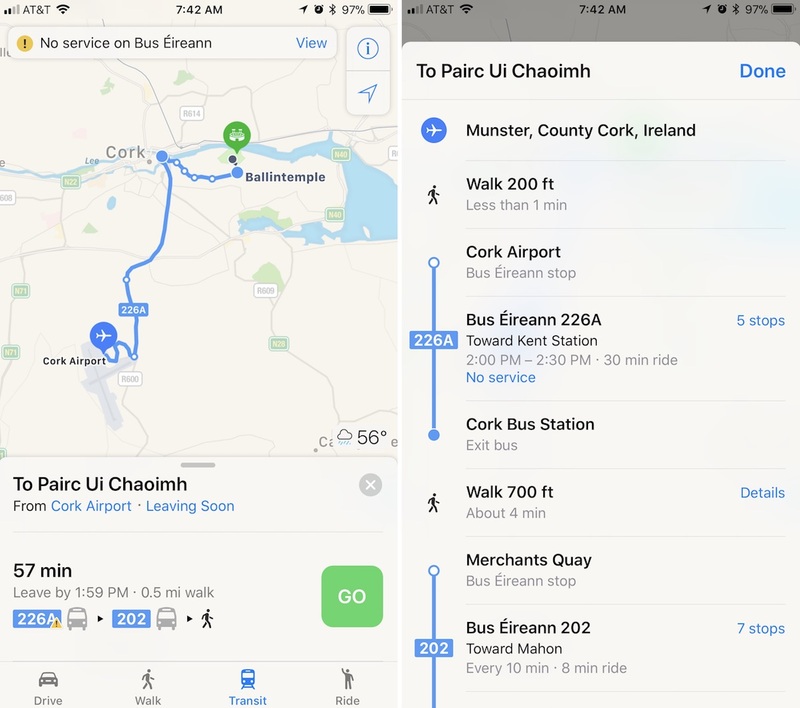 With the updated directions, users in Ireland can now choose from a few different public transportation routes when traveling around Ireland. Transit directions are available in a few cities like Dublin and Cork, including transportation provided by Bus Éirann, Aircoach, and more. There's also support for city-specific transit options like Dublin's electric rail system the DART (Dublin Area Rapid Transit) and Dublin Bus. Unfortunately, most of the transit options in Ireland are facing service cancellations in the face of Hurricane Ophelia, which made landfall around 1 p.m. local time. Many transit advisories listed in Apple Maps mention cancellations lasting from 10 a.m. to at least 7 p.m. local time in Ireland. Apple has been adding public transit directions to new cities around the world since the feature first debuted in iOS 9 in 2015. Some of the latest areas to get the feature include Taiwan, Ottawa, Edmonton, Québec City, and Hungary. You mean like... the USA? Last I checked it too is in the northern hemisphere. The UK and Ireland meanwhile get hit by hurricane force winds basically every year. It's only in the last couple of years that they've started naming them, because they realized it was a good way to get people to sit up and pay attention to the fact that there's a big storm coming through. Usually storms that hit the UK are only category 1, 2 at most though. Ireland is way more north in the hemisphere than the US. It is closer to Greenland than we are. I did say in My original post “so far in the northern hemisphere” which I assume would say it is more north than the US. Sorry, should have specified more. Happy to see Apple constantly improving Apple Maps. It has come very far since it’s disappointing launch. Excuse my ignorance, but I never knew countries so far in the northern hemisphere could get hurricanes??? Aren’t the ocean temperatures there too cool for that?